Here we go with another product review from the company that is popular in charging of mobile devices. I recently reviewed a different Anker wireless charger, and Anker has given us another great product on the market that will charge multiple types of phones quickly and conveniently. 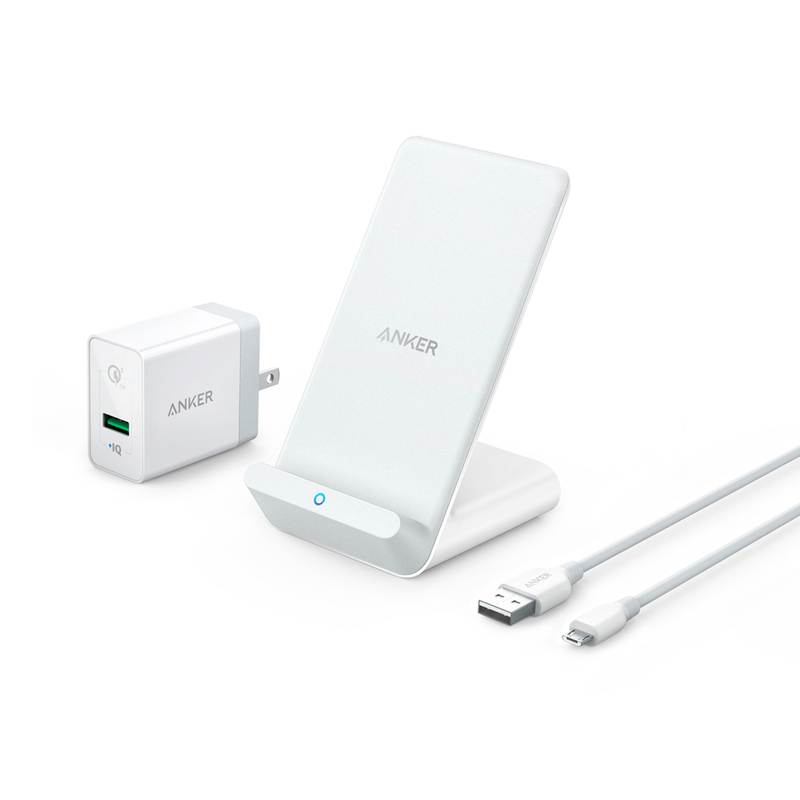 This is the Anker PowerWave 7.5 Stand. When you open up your box, you’ll find the items in the image above- the 7.5 stand, a USB to micro USB 3.0 Quick Charge cable, and the 3.0 Quick Charge wall adapter. This adapter is what I was looking for in the last wireless charger we were given, as it truly brings speed to your charge. The design of the stand puts your charging device at an angle for easy viewing- whether you want to place your phone vertically or horizontally. This is particularly good for the iPhone X with it’s facial recognition, so you don’t have to pick up your phone to look at the screen. There’s also a PowerWave 7.5 Pad, which might not be as convenient. The PowerWave 7.5 will work for multiple types of phones that are able to be wirelessly charged. It charges up to 7.5W for Apple devices, and 10W for Samsung. The charging speed is about as fast as the charging cord that comes with Apple phones. A little faster for Samsung devices, though. Still good if you don’t want to be dealing with wires constantly. The base has an internal cooling fan to prevent overheating which isn’t too loud, but you might hear a slight whirring noise. I think one would have to be extremely sensitive to sounds to be annoyed by it. It also delivers a powerful current able to charge through cases- even thick ones like OtterBox. Want to buy the PowerWave? The price tag for this product is about $49.99, which is a pretty good price for what you get. The Anker page directs you to buy at Amazon. Thanks to Anker for sending us the product to review for free in exchange for our fair and unbiased review. No other compensation has been given.